The orientation was held on the 8th May, 2018, in the media room and commenced at 9.00 am. Eighteen (18) students were present. 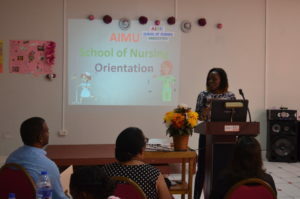 The orientation commenced with a prayer by a student, followed by introduction of faculty members by the nursing coordinator Mrs. Amsa Elumalai. Mr. Elumalai, Assistant Professor in the nursing department spoke about the importance of professionalism, in and out of the school environment. Mr. Elumalai informed students of the committees to be part of the nursing unit and the need for volunteers for the various committees. The Associate Dean Mrs. Grissel Leon gave a brief history of the establishment of the nursing programs which began as an Associate Degree Program in 2011 with an approved curriculum by Nursing Council of St Lucia and an update of progress of the nursing program. The program has been upgraded to a Bachelor of Nursing with an approved curriculum by Nursing Council of St. Lucia in April, 2017 The Associate Dean expanded on the program, indicating the requirements for entry and the length of that program which is 11 semesters. She told students to take their studies seriously and to seek help or guidance when necessary from relevant staff, if they are encountering problems understanding lectures, assignments or other problems. Attendance and punctuality were emphasized and their importance towards the granting of awards highlighted. Students were given feedback on the recent CXC-Regional Examination Nurse Registration (RENR) licensure examination. Five students sat this examination for the first time in April, 2018 and four of them were successful. Activities included presentation of awards to students who had performed excellently with a grade point average of 3 upwards and adhered to the university’s policy requirements. Students displayed their talents to show that nursing incorporates not only caring for the sick, but also social activities, and talents.